PowerTwin equipment designed to work with two convertible engines easily and without tools, Electric or petrol, an engine for every need. Made and constructed for companies and contractors who paint projects carried out large scale quickly and profitably. The PowrTwin ™ 4900 Plus is ideal for professionals that require reliable powerful computers in long you term. Only Titan manufactures hydraulic piston drawable equipment. Control of 400 PSI to 3300 precise pressure PSI, for spraying low viscosity paints, to the paintings of high density loads. Hydraulic fill cap and rod for easy access. MAX. FLOW, GAS ENGINE. 5,7 l / min. MAX. FLOW, ELECTRIC MOTOR 4,2 l / min. 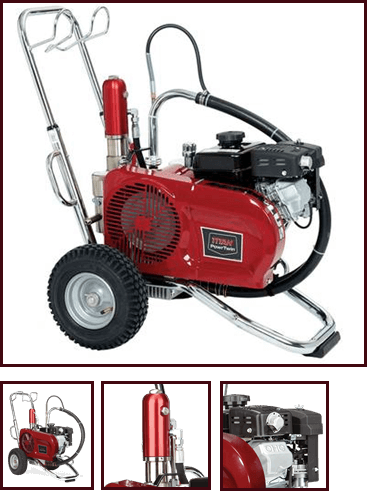 2 guns - 0.028 "
PowerTwin equipment designed to work with two convertible engines easily and without tools, Electric or petrol, an engine for every need. Made and constructed for companies and contractors who paint projects carried out large scale quickly and profitably. The PowrTwin ™ 6900 Plus is ideal for professionals that require reliable powerful computers in long you term. Only Titan manufactures hydraulic piston drawable equipment. Robust Honda ® OHV engine 160cc of gasoline with oil alert. 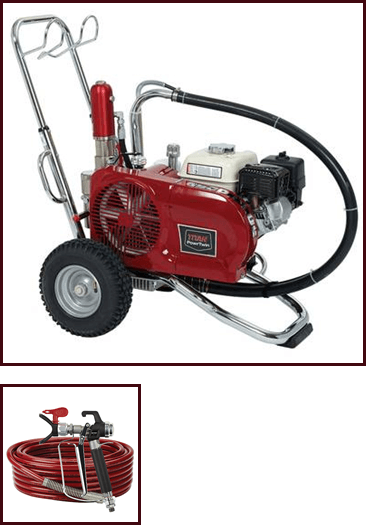 Accurate pressure control of 400 PSI / 27 Bar to 3600 PSI / 248 Bar., valve for low viscosity products, It allows to spray paints finish heavy loads. MAX. FLOW, GAS ENGINE. 8,5 l / min. MAX. FLOW, ELECTRIC MOTOR 4,73 l / min. 3 Guns - 0.023 "
For large projects, industrial and commercial - where the maximum production output is the difference between profit and loss. POWRTWIN ™ 12,000 PLUS, a super war horse, that you can spray any work or coating paint primer. Depending on the size of the nozzle, they can be mounted up to a maximum of four guns. Robust Honda ® OHV engine 270cc of gasoline with with oil alert. Accurate pressure control of 400 PSI / 27 Bar to 3600 PSI / 248 Bar, Valve for low viscosity products, It allows to spray paints finish heavy loads, filling paste, elastomers, etc. Dimensioned cooling fan that keeps the hydraulic fluid at low temperature for efficiency and a life long. MAX. FLOW, GAS ENGINE. 11,90 / min. Turbine HVLP spray without air. 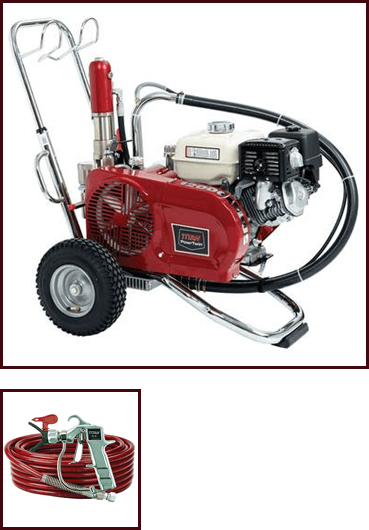 Painting equipment for textured or rough surfaces.